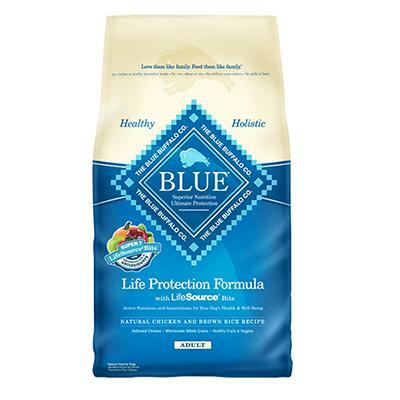 Blue Life Protection Chicken and Rice formula for dogs is an excellent food that provides superior nutrition derived from wholesome ingredients. Blue has created a formula that contains LifeSource® bits, which are tiny morsels full of antioxidants taken from 7 nutrient dense foods: Apples, Blackberries, Blueberries, Cranberries, Pomegranate, Pumpkin, and Spinach. These little bits help maintain cellular oxygen balance because they are "cold-pressed," meaning that during the manufacturing process, these mineral and vitamin rich bites were not exposed to high heat in an effort to preserve their integrity. Blue Life Protection also does not contain any chicken by-product meal, corn, wheat, soy, artificial preservatives, colors, or flavors. If you are looking for a food that promotes healthy muscle development, a healthy skin and coat, and an optimal immune system, feed Blue Life Protection Chicken and Rice formula. You and your canine will love the results! Deboned Chicken, Chicken Meal, Brown Rice, Barley, Oatmeal, Chicken Fat (preserved with Mixed Tocopherols), Tomato Pomace (source of Lycopene), Peas, Flaxseed (source of Omega 3 and 6 Fatty Acids), Natural Flavor, Potatoes, Alfalfa Meal, Calcium Carbonate, Salt, Potassium Chloride, Potato Starch, Dried Chicory Root, DL-Methionine, Caramel, Mixed Tocopherols (a natural preservative), Sweet Potatoes, Carrots, Garlic, Choline Chloride, Vitamin E Supplement, Ferrous Sulfate, Iron Amino Acid Chelate, Zinc Amino Acid Chelate, Zinc Sulfate, Yucca Schidigera Extract, Oil of Rosemary, L- Lysine, Parsley, Kelp, Blueberries, Cranberries, Apples, Spinach, Blackberries, Pomegranate, Pumpkin, Barley Grass, Turmeric, L-Ascorbyl-2- Polyphosphate (source of Vitamin C), Copper Sulfate, Copper Amino Acid Chelate, Glucosamine Hydrochloride, Nicotinic Acid (Vitamin B3), Calcium Pantothenate (Vitamin B5), Taurine, Biotin (Vitamin B7), Manganese Sulfate, Vitamin A Supplement, Manganese Amino Acid Chelate, L-Carnitine, Thiamine Mononitrate (Vitamin B1), Riboflavin (Vitamin B2), Vitamin D3 Supplement, Vitamin B12 Supplement, Pyridoxine Hydrochloride (Vitamin B6), Beta Carotene, Dried Yeast, Dried Enterococcus faecium fermentation product, Dried Lactobacillus acidophilus fermentation product, Dried Aspergillus niger fermentation extract, Dried Trichoderma longibrachiatum fermentation extract, Dried Bacillus subtilis fermentation extract, Folic Acid (Vitamin B9), Calcium Iodate, Sodium Selenite.